We're born, we live and then we die. That might sound particularly gloomy, but along the way we leave traces of ourselves, and those are the pieces that are important to a genealogist looking to Trace Someone. Those clues can help build a picture, not only of the person, but of the life they led. The first of those clues is birth. Births weren't always registered. That only first became necessary on July 1st 1837, when it was decreed that every subsequent birth, marriage and death in England or Wales had to be registered by the state. With births, the event would be registered in the district where the child was born, and at the end of each quarter, the registrar would send a copy of all the entries to the Registrar General. That means there should be two entries – one local, one national – for every birth since 1837. However, registering all three events didn't become compulsory until 1875. When it was introduced, the cost of a copy certificate was two shillings and sixpence (12.5p), one shilling (5p) of which went to the registrar and the fee stayed the same until 1952. This means that tracing births back to 1875 is relatively straightforward. Between 1837-1875 it might prove a bit harder, as some didn't register a birth or even gave false names. This may have been to hide the true age of a child so it could be sent out to work, or, after 1853, because parents wanted to avoid the compulsory vaccination of children at three months old. 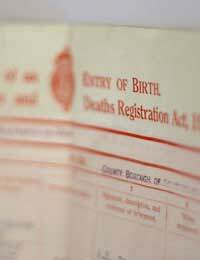 There was no penalty for parents who didn't register a birth until 1875, when a £2 fine was introduced. The General Register Office (www.gro.gov.uk) houses indexes for every registered birth, marriage and death in England and Wales since 1837, as well as every available census from 1841 onwards. This information used to be held in the Family Records Centre (FRC) which has now closed. There is also a Register of Adoptions since 1927, microfilm copies were provided by the Prerogative Court of Canterbury (PCC) from 1383-1858, microfilm copies of the PCC's Act Books recording grants of letters of administration between 1559 and January 1858 as well as the Nonconformist parish registers. In other words, it's a genealogical goldmine. Their birth indexes are divided by year, and each year by quarters. Each quarter is then divided alphabetically by surname. So, if you know a person's full name and date of birth, in theory it should be easy to find in the index. However, it's worth remembering that, with six weeks allowable for registering the birth, it might not appear until the next quarter. With all the information from the register, you can order a copy of the certificate (which isn't free). A birth certificate can impart quite a bit of information about an individual. It gives the names of both parents (at least where the father is named, which is not going to be the case every time). You'll always get at least the first forename of each parent in full – all forenames before 1865 – and their occupations. Additionally, you find where the child was born, right down to the street address, and even the mother's maiden name. It makes for an excellent starting point. The person might have changed their name (by deed poll, for instance) later in life. It's not common, but it does happen. There could be more than one person with the same name born within days of each other in the same district. The more information you can supply, such as exact date of birth or parents' names, the greater your chances of success. The entry might be in a different district. Just because you were told (or believe) a person was born in a certain place, that's not necessarily true. Be willing to check the information for surrounding districts, too. The birth might not have been registered. This is possible between 1837 and 1875, when, in some parts of the country, up to 15% of births went unregistered. The birth might have been incorrectly indexed. Since clerks only wrote what they heard, a name could have been misspelt or a date of birth record incorrectly. For more information on birth certificates and genealogy, read our articles Scottish Births and Birth Certificates To Trace Ancestors and The Use Of U.S. Birth, Marriages And Death Certificates In Genealogy in this section. Hi does anyone know how long you had to register a baby after birth in 1967 as my husband was born in the may but not registered until January 1968? Please can you tell me why on a 1920 birth certificate Father's occupation is general labourer but also has Eoc-Pte R H after it? If the father is not named on a 1915 birth certificate, which is the best way to trace this person please? (my Grandfather) When will the 1921 census be revealed? Although 19th century birth certificates are very useful tools, certainly after 1875, the earlier ones should always be questioned. Most people gave truthful information, but if there seems to be a conflict, it's worth questioning the information on the birth certificate (even if there is one - the figure of those not registering births before it became a legal requirement isn't known, but estimated at at least twenty per cent).